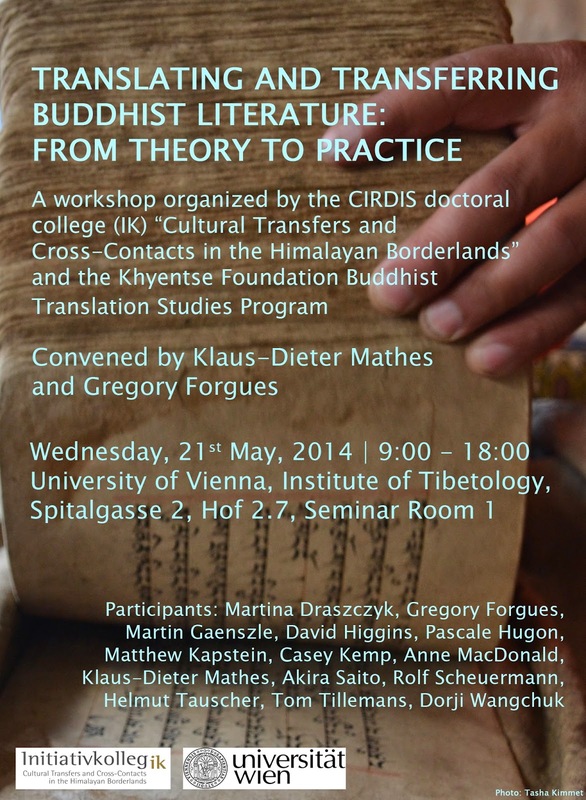 Workshop: "Translating and Transferring Buddhist Literature - From Theory to Practice"
Update: since the announced event took place already, you might prefer to read the report with impressions from the Buddhist Translation Workshop at the University of Vienna. The announcement comes a bit on short notice, but I would like to draw your attention to this upcoming workshop. It should be highly interesting for anyone interested in Buddhist Studies and/or Buddhist translation. The workshop will take place on the 21st of May at the University of Vienna, from 9:00 a.m. to 6:00 p.m. at Seminary Room 1 of the Institute of Tibetology, ISTB, Spitalgasse 2, Courtyard 2.7. It is convened by Prof. Dr. Klaus-Dieter Mathes and Mag. Gregory Forgues. This workshop will address practical concerns of Buddhist translation studies in relation to the methodological approach being developed within the IK Cultural Transfers program on issues of transference and translation of Buddhist literature. New approaches to cultural history emphasize the importance of the process of translation in the transmission and reception of texts between source and target cultures. ?Cultural translation? focuses on the practice of translation as a medium to transfer key ideas between cultures. In this context, translation is not merely a one-to-one linguistic rendering of concepts and representations. It is understood as a cross-cultural production process of meaning through which the original text is interpreted, reinterpreted, altered, or distorted. In the case of Indo-Tibetan Buddhist translation studies, the complexity of translating texts into modern languages is compounded by the fact that this process is the result of a double cultural transfer between Sanskrit and Tibetan, as well as source languages and modern languages. This workshop will provide an opportunity for in-house scholars and academics from abroad who have been working on related projects to collaborate and discuss Buddhist translation as a mode of transference. Issues related to textual and philological analysis as well as methods of translation with regard to equivalence at and above word level, textual and pragmatic equivalence, semantic and lexical aspects, transposition, word order, and stylistics will be addressed by the participants. This workshop will explore and map relevant translation issues with the aim to define a methodology for training professional translators of Buddhist literature.